Schmidt Technology Corp., Cranberry Twp. PA, introduces its toggle press Model 13V, which has a rectangular ram. 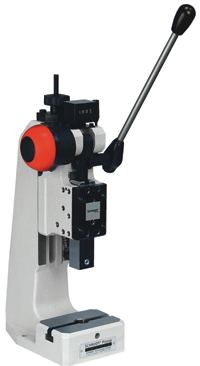 The ram is best suited for applications requiring torsion-proof anti-rotational operation. To ensure precise, backlash-free ram operation and long service life, the press includes adjustable and replaceable two-sided Teflon-lined flat gibs. The press can be ordered with a ram-return stroke lock—once the operator has completed the full ram stroke, the mechanism automatically releases and the handle returns to the ram home position, ensuring stroke completion and repeatability of the pressing operation. A spring-loaded quick-release button permits emergency release of the locking mechanism in the event of improperly loaded parts, defective assembly components or missing parts—as well as to ensure operator safety. See also: Schmidt Technology Corp.